NB It has been some months since my last encounter with my friend and colleague Sherlock Holmes and even longer since we were involved in a case of any significance. Shortly after the adventure related in my story ‘Revenge of the Hooded Claw’, the Great Detective set off for Burma on the trail of arch-villain Dr Fu Manchu. Though I had urged him to allow me to accompany him, he was adamant I should remain in Londen with a view to ‘being my ears and eyes’ in his absence. Initially, I interpreted this as a snub, and spent several weeks bemoaning the fact that my worth must be as relevant to him as a dead horse, since he rarely gave praise or complemented me on my intuition. However, after prompt replies to my weekly letters, I realised he did value my contributions but had considered my safety (and that of my wife’s) as paramount in his investigation. Having dispatched my latest missive last Friday, I was somewhat surprised to receive a telegram from Holmes this morning summoning me to Baker Street. It seems he’d returned to the metropolis and wished to see me as a matter of some urgency. Mrs Hudson caught me in a bear hug at the front door, then showed me upstairs with her usual eagerness, though all the while uttering remarks relating how that, in her tenant’s absence, I had simply ‘not bovvered’ with her, or considered that she might like ‘a bit ov male company ov a dark and dreary night’. Issuing a few compliments on her appearance and the warmth of her welcome, I was heartened to see her wizened face light up once again. She left me at the door with the promise of heating up a trayful of muffins and a pot of hot chocolate. Holmes was seated in his usual armchair by the fire, and waving me into my former pew opposite, gestured to the corner of the room to which, until that moment, I had not paid any attention. Making myself comfortable, I looked over and for the first time discerned the figure of a man sitting in shadow. His hat was pulled over his eyes and a dark suit did nothing to illuminate his complexion. Holmes nodded and resting his elbows on the arms of his chair, steepled his fingers. “Doctor Watson, I should like you to meet a fellow medical man, Doctor Eddie Armstrong. In a moment I should be obliged if you would utilise your skills and examine him, but for now please take a look at this.” Reaching up to the mantelshelf, he took down a piece of white card and passed it across to me. “Why?” said Holmes, a smile playing around his thin mouth. The man in the corner coughed suddenly and whipping out a large handkerchief, covered his mouth. Even so, I couldn’t help noticing a few spots of blood appeared on the cream-coloured material. 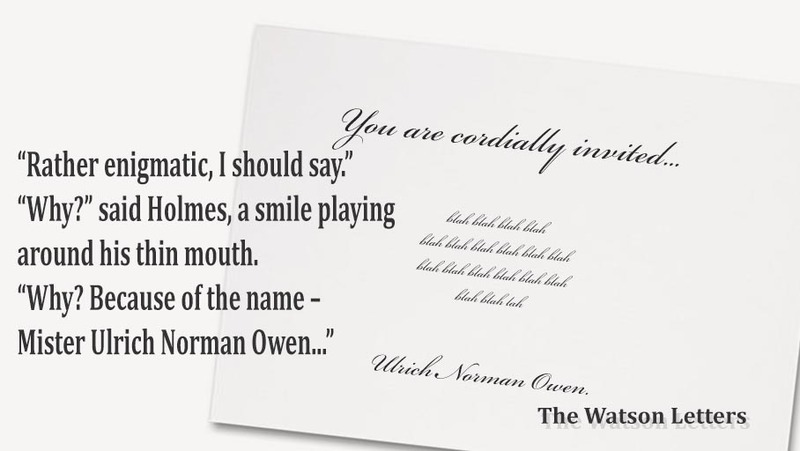 Oh… this looks like a great beginning *grins* Ulrich Norman Owen, I see what you did there! And I’ll take the chance to wish you very merry holidays! See you next year!